Last week-end, I went to the BConnected Conference in Ottawa where I learnt great tips to develop and promote my blog. I also met 2 amazing authors of children’s books: JC Little and Louise Courey Nadeau. JC Little was a speaker at the conference, and her presentation was very funny. My husband, Frédéric Sune, won her book in a draw, and I quickly stole it from him! 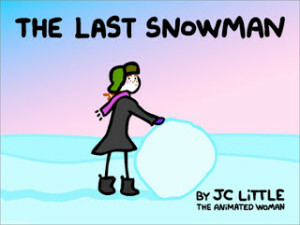 The Last Snowman by JC Little, is the true story of the author’s daughter who decides to build a snowman in early spring, a time where snow is heavy and perfect for such an endeavor. Her mother watches through the kitchen window while making dinner. Now I won’t spoil the ending for you, but the conclusion to the story is both clever and moving. JCLittle uses simple but effective drawings with bold lines. In addition, the text is short and sweet proving the saying that “A picture is worth a thousand words”. The author’s love for her daughter shines through. In fact, she dedicated The Last Snowman to her daughter, the star of the book. This is JC Little’s first published work. However, a new book, Motherhood, will be coming out at the end of April. The author also has a blog The Animated Woman that captures the small but beautiful moments of everyday life. I highly recommend that you check it out, especially her posts Zombie Mom and How to check for pinWORMS which are both hilarious! I’m so glad you could tell that I love my daughter from The Last Snowman… I’ll be showing her this review, you can be sure! Thank-you for your kind words Cécile. Thanks for sharing and JC was an amazing speaker! She was a great speaker. I agree!